Stone is the substrate winner for encaustic! It really loves the wax. I think that the over the winter drawing has really helped me loosen up. I feel so much more at ease laying in work with paint. I am going to try and stick with the shell idea for as long as I can. Now that the shed is up and running I can pick and choose what subject matter is good for encaustic when the inspiration hits me. This shell just fit right onto this stone. I would like to do some with several shells, deeper shadows and really vibrant colors. The encaustic on stone really enhances the colored pencil against the casein–I need to learn to plan for this and take advantage of it. This is approximately 3″ x 5″, casein underpainting with colored pencil, graphite and encaustic. 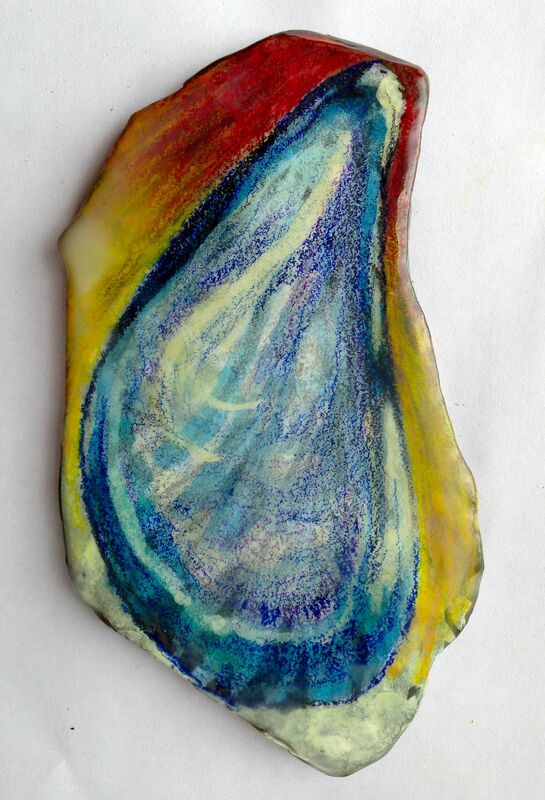 This entry was posted in Uncategorized and tagged casein, colored pencil, encaustic, mussel shell, stone. Bookmark the permalink. I’ve been browsing your entries on using casein–find this most unusual to use it on paper because it can crack on flexible surfaces. (I assume in your coloured pencil paintings you use it thinned down.) Used in wax–do you actually put the pigment in the wax and then paint with it? I am not familiar at all with encaustic. I have tubes of the Shiva brand casein. I’ve been meaning to finish a little chip-carved box I found in an antique store–started in casein which dries lovely and hard on rigid surfaces. It has such a smooth feel and that strange smell! I started it in 2006–you are inspiring me to finish it. Thanks for the comment Judy. I am new to the casein, and really haven’t considered whether paper is an appropriate substrate or not. I am using it fairly thin in most cases. I just started a piece on canvas…and I was advised by someone who uses casein a lot to make sure I keep it thin on canvas. The result so far is very nice. In the encaustic work I am doing I am actually painting right on the stone, drawing in pencil on top after its been dry. The wax medium is then applied on top–and it’s clear, so I am not using it to “paint” with. I might add some encaustic paint color as I move along this summer. I hope you get to finish your little box, that sounds interesting!